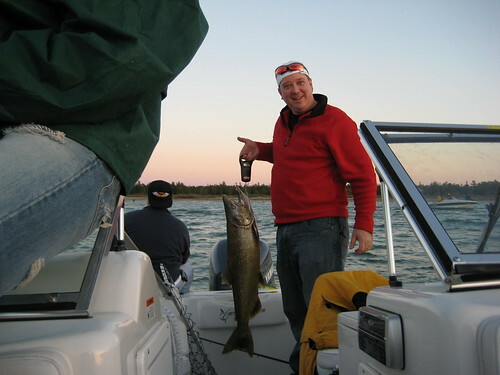 Some call it “Catfishing with Keith”, others call it “Fishin’ with Geeks”, others call it “Fishin’ with Friends”, whatever you call it plans are underway for 2012. You’ll find all you need to know about this annual event among the links below. Any questions that aren’t clear or unanswered please contact me. The better part of this summer after work and on the weekends I spent restoring my boat. My sister and I planned a camping trip for the nephews the weekend of August 7th and I didn’t want to go to the lake about an hour away without my boat. Problem, the boat has been at a buddy’s lake house for about two years and is starting to show wear. It is time for some TLC and restoration. In cases like this it is always best to have a buddy who A) has more experience than you and B) has more tools. My buddy Joe agreed to help me with the project on the weekends. It is important to note that Joe has a masters degree in industrial arts and can fix anything. He also has tons of tools I would otherwise have to buy. Yes he’s a good friend to have around. The first thing I had to tackle was the trailer because I had to go and get the boat from the lake. The running boards on the trailer were rotten. Thus the boards and the carpet on them needed to be replaced. The trailer is in great shape otherwise. It is a galvanized trailer (which means it won’t rust). For the running boards I used treated 2×4’s. I only had to buy one 8ft board and cut it in half. In no time we had them on the trailer and sprayed with contact cement so we could attach the new carpet to them. After a few hours of waiting on things to dry and cutting the carpet to fix the running boards we were in business. The boat is blue (I hand painted it several years ago, so I wanted the carpet to match the existing color scheme). I think it turned it nice. Looks like it came from the factory. While we were working on the trailer I decided to purchase new tires for it. The existing tires had dry rotted and I knew they were not fit for any long trip. I picked up two new already mounted tires on the wheel for about $50 a piece. While we had the wheels off I wanted to grease the hubs. Luckily bearing buddies had already been installed so it made that REAL easy. The last thing to do on the trailer were the lights. I had accidentally cut the light plug off with the lawn mower earlier in the year so I had to put a new plug and wiring on the front. Not a huge deal. The trailer was done, time to go pickup the boat. The boat is a 12ft aluminum boat. When I lived in Ann Arbor, MI years ago a fellow driver ran into the back of my boat while I was stopped at a red light (by the way, it is the light right past the Heidelberg if you are familiar with downtown Ann Arbor). Anyway, the motor I had at the time was broken off the back of the boat and the transom wood on the back was severely busted. While it worked for awhile it was getting to the point to where you didn’t trust it. I purchased a 3/4inch treated piece of plywood to rebuild the transom. We used gorilla glue to glue two pieces of 3/4inch plywood together and then cut it to fit in the back of the boat. Getting all of the stuff off the back and cutting old screws was the tough part. After a little sawing to fit into place things were looking up. To add further stability to the transom Joe took some aluminum angle iron and fit it over the back of the transom to give it extra strength so we would have a place to drill the pieces back into. We sealed it all with silicone to further waterproof it and it turned out awesome. I can honestly stand on it and nothing moves. I purchased new seats for the boat since the ones that were on it were extremely weatherized. The wood on the inside of the boat needed some serious TLC as well. We sanded and then coated the existing wood underneath the seats. It took several days to finish this part since we had to wait 12 hours per coat to dry. From here you can see the before and after the finish adds. It really sealed the wood to give it a longer shelf life no doubt. As I mentioned earlier, the boat is 12ft. The boat is great for rivers, back waters, and small lakes. The only problem with it is you have to balance weight. I had decided that I wanted to build a battery box in the front under the front seat so it was out of the way. We took the left over treated plywood and started measuring for the biggest battery box we could make. Previously the battery had to be in the back of the boat and it was a pain to constantly hook everything up. I also wanted to simplify that as well. Here’s how the box turned out. Not bad if I say so myself. This is much easier and it helps to balance the boat out even if I’m in the boat by myself. Having the battery box in place meant wiring had to be run. Along the side of the boat is an indention. To hide the wires out of place I purchased some conduit and we ran the conduit inside the indention and then permanently attached it to the hull of the boat with silicone. Look for that grey tube a couple of pictures up for what I’m talking about. Once the conduit was in place I rewired the whole boat. I ran wiring from the battery to the back of the boat for the trolling motor and made an easy attachment plug. I also re-ran wire for the depth finder as well as the light required for the back of the boat. After getting the wires ran I spent a lot of time tacking them to the underneath parts of the seat and wrapping them with electrical tape. A pretty good job if I say so myself. Runners were something I have wanted to have on the trailer for a long time. I purchased some from the Internet after seeing them in a local sporting goods store (they didn’t have the size I needed). Runners serve two important purposes. One is to be able to see where the boat trailer is behind the truck when backing it down the ramp. We have some really steep river ramps here. Without runners one is backing a boat down a ramp blind until the truck clears. Not fun if you are trying to launch the boat on your on. The second thing the runners serve is to be able to easily get the boat positioned properly back onto the trailer. The runners were an easy install. They just mounted onto the trailer. After it was all said and done I am very pleased. This boat will be around for a long time (even if I don’t own it) and is sure to help bring in the big ones. And what do you know. It even floats after all that work. This was a fun project this summer and I learned a lot working with Joe on the wood work. He’s truly a professional. In the end I met my deadline but not without long nights after work and a lot of sweat in the Mississippi summer heat. At least my hard work paid off on the camping trip with a mess of blue gill worthy of cleaning. Salmon Hunt 2007 a Success! Our salmon trip for 2007 was a success! We had a great time on Lake Huron and the weather was only really bad the first day. The wind was blowing into the bay at about 20-25 mph producing some nice size rollers. I wound up on the winning boat, the Striper, and on my rookie voyage salmon fishing I caught the most fish! Never under estimate a southerner when it comes to fishing. For the most fish award I would like to thank Abu Garcia for making the 6000 model and Berkley for the IM7 rod. Without you two, it wouldn’t have been possible. My plane arrived in Detroit on Wednesday so I got to spend a little time in the office. Thursday morning after getting dropped off at Kevin’s house by the Morlock, Kevin and I drove from Livonia over to Birmingham where David “Captain Jew” Little lives. We threw our gear into the truck, hooked the boat up and were on our way to Rogers City, MI to meet up with everyone else. We arrived at Brad’s cabin around 3:00 PM and the rest of our cabin was there. We threw the football around a bit and Brad showed me around his place. I then remembered I needed to load new line onto my reels so I got out my rod and reel and loaded new Vanishing fluorocarbon 14lb on it. As soon as I got done we loaded up to hit the water. We drove over to Brian’s (Brad’s twin brother) and met up with the rest of the gang and then headed into town from Hawks, MI where we were staying to Rogers City. Everyone was pumped, even Radek who had never been fishing before. We launched the boats and it was game on! When we got to the bay, we fished probably for over an hour before anyone got a bite. Captain Little took the first fish of the trip on Thursday evening. It was a nice 9-10lb fish. At this point the game was on since our boat, the Striper, had caught the most fish two years in a row over Ben’s boat. We fished until after dark, but the fish just weren’t biting. We rolled back into the marina and had Jay clean the fish for us then headed back to the cabin to play cards. I won both Texas Hold ‘Em tournaments and was feeling good since I was up about $100 for the trip, and we had a fish. Physically I was tired, the difference in time zone was killing me. We got to bed at about 2:00 AM on Friday. With only 3.5 hours sleep the cabin woke up at 5:30 AM and it was a chilly 36 degrees. Burr! We knew it was going to get cold so we bundled up pretty good for the ride back out to the bay. The ride out sucked. That is all I can say. It was a 3-4 mile ride with rolling waves that made you wish you had a bigger boat that is for sure. We finally got out to the bay and got anchored down but we could barely stand up in the boat. It was cold, the wind was blowing 25mph and making huge waves that were 3-6 feet rollers. The conditions were not great but we fished. I finally made my way to the front of the boat so I could sit down, actually law down and cast from the side. After about 3 casts I had a fish on! Finally I had caught a salmon. Now I knew what to expect. I noted my retrieval speed, the location I caught the fish, how the strike was and so on. Once we got the fish in the boat and in the live well, I went back to the front of the boat. Same spot and started casting. Within a few more casts I had another fish on! Radek, who again had never been fishing before, landed one as well. We fished some more but the water was too rough so we went in about 8:30 AM. 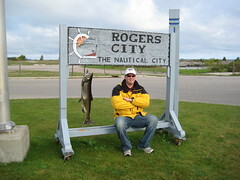 When we got back to the marina I hung my biggest fish from the Rogers City sign to document the occasion. After we had breakfast I decided to ride with Ben, Mike and Lance to Cheboygan, MI to see if the salmon were running in the river there. After a 40 minute ride we arrived only to be disappointed. We decided to head back into town and do some bowling to kill the time. By this time, my central time zone body was hurting. With only a few hours sleep, and the time zone shift I was death walking. We bowled several games and I was so tired and sore from the ride earlier in the morning that I didn’t even pick up a spare, little alone a strike! Ben, Mike and Lance won some of their money back from the night before needless to say. The rest of the guys showed up and we ate some pizza, drank a few beers, bowled some more, and then headed to the water, hoping it wasn’t as rough as the morning. Thankfully it wasn’t and that night I caught two more fish and Radek another. Ben’s boat was catching up though and now they were only down one. Damnit! After we got the fish cleaned we headed to the Night Hawk’s Bar for some burgers but they were out. How can you be out of burgers?! We had to settle for something else. Ben and I got Reuben’s and Mike got shrimp. Because when you think of the Night Hawk’s Bar and Grill you think of shrimp right? Hah! It was late when we got done eating so we went back to the cabin and crashed. We awoke at the same bat time and bat channel and headed to the marina. What a pretty morning. The water was calm and we were able to get out to the fish much faster. The only problem was they just weren’t biting. Nothing, zilch. So we got the boats loaded back up and headed to breakfast and then back to the cabin since it was college football game day. I took a nap trying to kill the time zone monster. We watched football and then at about 4:30 the race was on back to the marina. Literally it was a race to see who could get there first since we were now down a fish. The water was a little rougher in the evening but manageable. We decided on a spot and fished it, nothing. We needed two fish for the win. We moved closer into shore and fished a spot really hard. No one was catching anything this evening. The fish just weren’t coming into the bay. Ben’s boat decided to move closer in which opened up a spot where we caught fish last night. Not only did we catch fish there, but I caught the biggest fish of the weekend there. So we moved and luckily we did cause it paid off (thanks for moving Ben!). At this point Kevin hadn’t caught a single fish but he hooked up about 30 minutes after dark with one. It was small, but it counted! Several minutes later I hooked into a 12-13lb and we landed it. Whew, it put us over the top for the win! When we pulled back into the marina we were blaring the radio and having a blast. “Hey Striper, leave those fish alone”…. “All in all its just a, nother fish in the well.” We took the liberty to rewrite the words to a classic Pink Floyd song as we pulled back into the marina. Absolutely hilarious. After we got the fish cleaned we headed back to the bowling alley for pizza and cosmic bowling. At this point our trip is winding down. Sunday morning we cleaned up the cabin and drove back to the city listening to the Lions vs Bears game (really good game). All in all it was a fabulous trip, we had a blast. I can’t wait until next year to go back. FISH ON!!!!!!!!!!!! If you have time, have a look at all of the pictures from Salmon Hunt 2007.